I should have known from the moment we laid eyes on Kelly that she was not going to be a warm and gentle soul. She was the first to hatch out of her clutch and, when we first met her, stood looking at her younger siblings with a sort of detached haughtiness that was certainly a sign of things to come. But, Patrick was drawn to her immediately so I bit my tongue and we chose her for our flock. As a juvenile budgie, Kelly kept her rage under wraps, she had been clipped and seemed to understand that she needed her human flock for mobility assistance. We had fun building her ramps and bridges, but Kelly was more interested in taking off and seeing how far she could go before thumping to the floor. Once she molted her way into flight and adulthood all bets were off. Even before she was fully mature she started chomping at us any chance she could get. Not really limiting her biting to territory issues, Kelly liked to preen you gently for a few moments and then start biting! Flying in the face of some common budgie wisdom, Kelly seemed to bite either for her own amusement or just inherent anger. 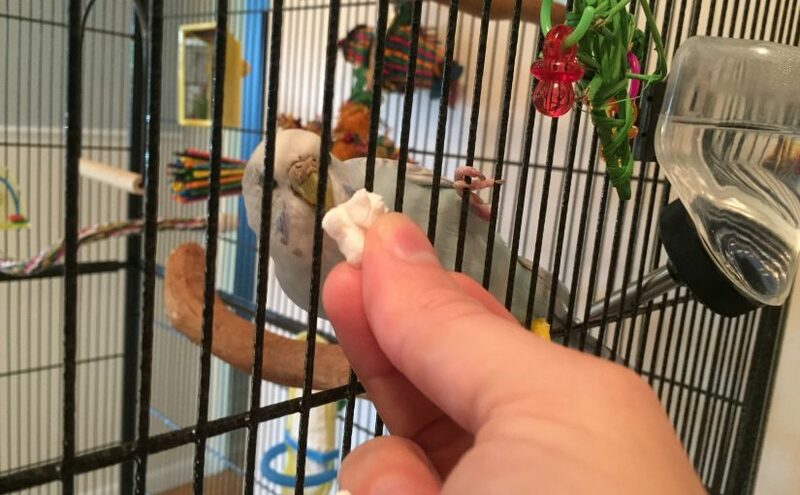 We’ve tried all the many many tips for a biting budgie, which is pretty well documented on the blog already, and only succeeded in making her angrier. So, it’s not a huge issue to keep our anger-inducing human selves away from Kelly and let her live her best budgie life. But where I feel bad for her is that she can’t seem to make it work socially with other budgies. I thought she and Toby had issues because they are two adult females, so we brought in Kevin and Kelly’s pretty much equally aggressive to him. He doesn’t escalate the way Toby does, thankfully, but still, no solace in the friendship of budgies. Kelly can’t live with them because she’s got a nasty tendency to bite feet to the point of physical injury, but she doesn’t understand why she’s relegated tjo her own cage (mansion) at the end of the day. The result of that frustration was the recent mania for biting the cage bars, which we mostly managed to stop by providing an insane amount of things to chew and destroy. TL:DR Kelly didn’t seem to be very happy, and I felt terrible for her. Enter AviCalm . I was doing research one day about how to help an angry parrot and stumbled across this product. 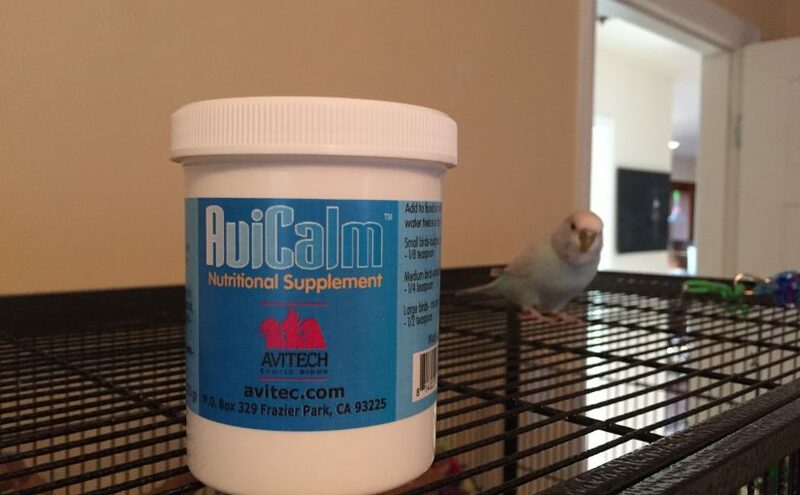 AviCalm is a supplement that is put in the budgie’s food or water and when ingested, helps with calming them down. AviCalm can be used on screamers, feather pickers, chewers and aggressive birds in general. There are dosing suggestions by size on the packaging; we have been using half of the recommended dose for Kelly for about a month now. While she’s certainly not turned into a snuggle buddy, I have to say that AviCalm has helped immensely with her aggression. Patrick and I are starting to be less afraid when she lands on us, I’ve even tried stepping her up a few times and while I’ve gotten bit for it, she hasn’t broken skin in weeks. Biting is still a likely eventuality, but it’s not with the same ferocity she used to dole out on a daily basis. She even landed on my head and preened my hair yesterday without biting at all; I literally almost cried. Beyond helping with her aggression towards us, I think that Kelly is feeling a lot better and calmer. She’s been way less fixated on Toby and has been able to relax by herself and play. Kevin loves singing and Kelly has been joining in, which is incredible. The biggest change has been our bed time routine. We used to have to chase down Kelly and battle to get her in her cage every night. She would obsess over Toby and fight with her through the cage bars until we sometimes resorted to gently nabbing her in a pillow case. Not anymore! Now I ring the bell for bed time and she is FIRST in her cage and goes right to the perch where she gets her reward. Even if Toby and Kevin are monkeying around, Kelly knows what the objective is, completes it immediately and even seems happy to do it! It’s amazing to not feel like we are torturing her every evening. Reviews of AviCalm seem pretty mixed; based on my experience I heartily recommend giving it a try if you’re dealing with a difficult budgie. At the half dose we still see all of Kelly’s personality, she’s feisty, likes to explore and wants to assert her dominance, but we take the edge off of the incessant biting and obsessive behavior. Obviously I’m not a parrot psychiatrist, but I do think that Kelly is happier on the supplement. That reminds me! Disclaimer: I am not a veterinarian nor am I providing medical advice for your budgies. I am merely providing a review of my own experience with a product. YMMV. This post was not sponsored by AviCalm , but as usual the links are affiliate links. 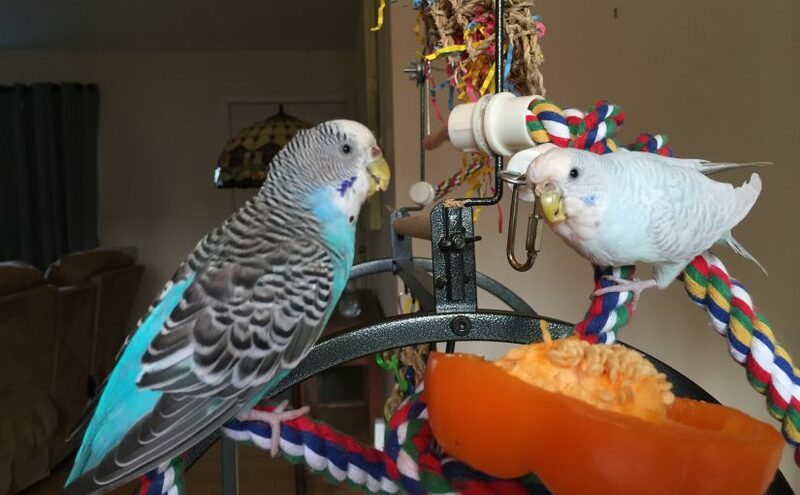 Last week, I published a post about the budgies experiencing popcorn for the first time. In response, a kind reader commented that in a budgie group recently, someone recounted the experience of having their budgie choke to death while they desperately tried to save her. The culprit was, of course, popcorn. I am so grateful to the person who let me know about the recent situation. First, my heartfelt condolences go out to the person who so recently lost their pet in a tragic and traumatizing manner. Second, I would hate to ever espouse any course of action that might lead to a budgie being injured or worse. I wondered whether popcorn is a frequent choking hazard, or if this was a one in a million incident. Writing this blog, even for a relatively small audience, I’m aware of a responsibility not to publish harmful or misleading information. At the same time, I’m just a budgie parent, not a vet or avian specialist, and I’m learning as I go along too. In order to gather some more data about a possible link between popcorn and choking, I posed the question on a FB page called Feathered Friends. This page provides an incredible resource, with nearly 80,000 fans who are parrot enthusiasts and owners it’s an excellent place to post a question and get a ton of well-reasoned answers. What I gleaned from the many responses was that a budgie choking on popcorn is not a common occurrence. Also, it confirmed my concept that, much like humans, a budgie could choke to death on anything they ate and it would probably not be possible to eliminate all dangerous foods. I was also called ignorant (yay internet!). As I’m sure we all know, asking questions is the way we conquer ignorance! Some folks did feel that popcorn is inappropriate for smaller parrots. So, before you decide to try popcorn as enrichment, weigh the risks versus the reward, but also know that we can be the best informed and the most well-intentioned bird owners, and tragedy may still strike. As a best practice, make sure to remove all kernels from the popcorn you provide your budgies. I mentioned in the original post, the popcorn should be free of salt and butter. You can also remove any hull-like kernel pieces to reduce the risk of choking. I think you can easily keep popcorn off the menu for your budgies and they won’t know the difference. I think you could give popcorn once a month for the next ten years and most likely nothing bad would happen (except you’d be cleaning up shredded popcorn once a month!). The thing that’s important to me as someone who is concerned with honesty and transparency is that I let my readers know what I’ve found out about the possible dangers of popcorn. That way you can make a better informed decision for your budgies. As far as things go for our flock, I will give Toby, Kelly and Kevin the chance to explore popcorn as often as we make it, which is about 4 times a year. While I understand there may be a risk inherent, I also don’t want to dwell in the fear of what might happen. 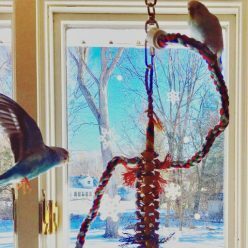 Parakeet weight update – have Toby & Kelly slimmed down? 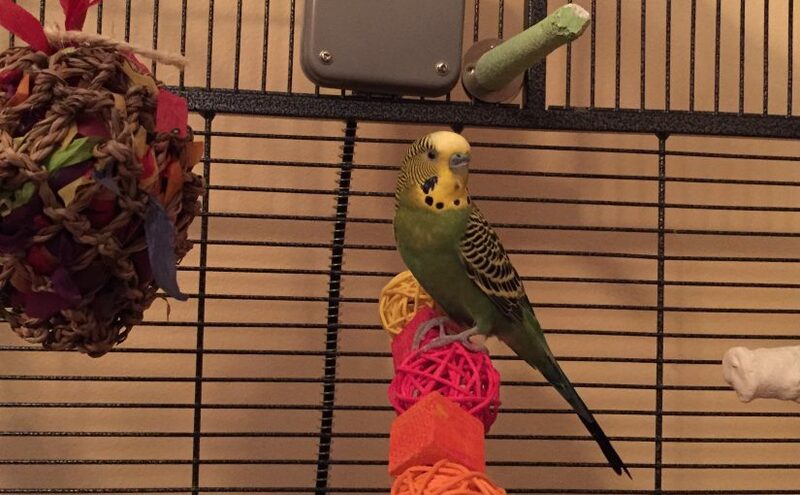 Our new parakeet, Kevin, seemed shockingly small to us when he first came home. Compared to Toby and Kelly he was as light as a feather. We naturally felt that he was underweight, but since he was having such a hard time with trust we didn’t think we could get him on the Food Scale for a weight in. We weighed Toby and Kelly instead and, to our horror, found that they were overweight! Looking up healthy parakeet weight, you will find a few different ranges, some say 25-36 grams is the healthy range, while others say 30-40 grams. I should mention that all of our parakeets are the smaller Australian parakeet, versus the larger “English” budgie. Toby and Kelly knocked it out of the park, with Toby weighing in at 43 grams and Kelly at a whopping 55 grams! Ouch! I immediately renewed my commitment to healthy feeding. Right now they are on a mix of Harrison’s High Potency Super Fine , Volkman Avian Science Super Parakeet and Dr. Harvey’s Our Best Parakeet Blend Natural Food for Parakeets . The Harrison’s high potency is not a forever thing, Harrison’s recommends switching over to pellets with the high potency and then switching to Harrison’s Adult Lifetime Super Fine which is for long term feeding. I am still completely on the fence about pellets in general. I’m not sure that they are part of my long term feeding plan. But, I’ll try anything to see what works best for our flock! In addition to changing up our food mix, I also recommitted to feeding fruits or vegetables every day, and that’s been going well! I think I enjoy watching them play around on a plate of veggies as much as they enjoy doing it. I’m not convinced they are eating all that much of it, but as long as they throw the food around and get some enrichment I’m good. It’s been about a month since we made the changes, and while they haven’t shed enough grams for a stunning before and after photo I’m happy with the progress. Toby is down to 40 grams, and probably at a healthy weight for her. Kelly dropped to 50 grams, which is percentage-wise a substantial loss. We will keep working on her, but I do seriously think that she has a bigger frame than Toby and Kevin and should probably weight more. Kevin decided it would be okay to get on the scale and originally weighed in at 23 grams, which is too low, but I think he was scared to eat well in quarantine. Also I’m pretending that the weight of his missing flight feathers would have gotten him into a non-danger zone of being underweight! Now that he’s been out of quarantine for a few weeks he is up to 29 grams, which is a nice and respectable, but still quite slim. I’m hopeful that we can keep Kevin and Toby where they are and maybe help Kelly lose a few more grams. The parakeets are all bunking in together at this point and I think that having in-cage companionship during the day may help encourage all of them to play more. Fingers crossed that it keeps going well, but it’s great to see that a few changes can make a difference in helping to maintain a healthy parakeet weight! 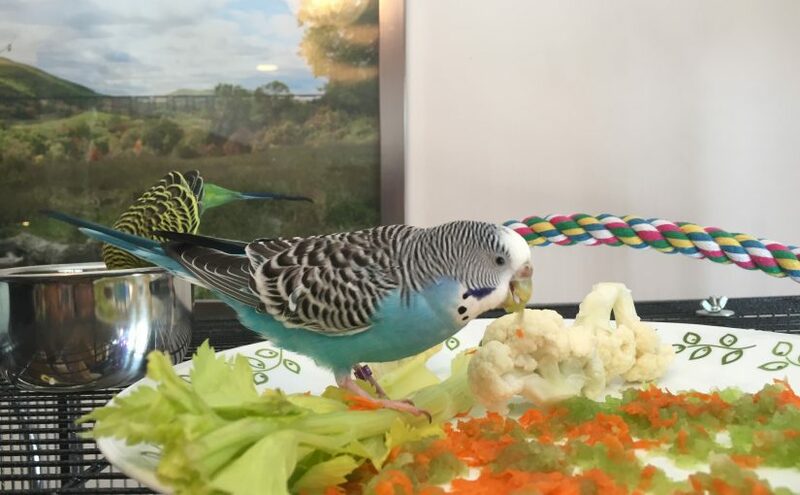 Posted on January 12, 2018 January 12, 2018 Categories Our Parakeet StoryTags health, overweight, parakeet health, weight14 Comments on Parakeet weight update – have Toby & Kelly slimmed down? Kevin has been quite sad in quarantine, and we will all be happy to see him out of it! We had high hopes for using the time to bond with him but Kevin remains very resistant to our human wiles and trickery, although he will happily take our millet. The plan was to use quarantine for human-loving boot camp. We’ve been spending time with him every day in our own ways. Patrick focuses on basic training, teaching Kevin how to navigate a cage and how to play. Cage navigation training was a rousing success, play has not worked out very well so we’ll be relying on Toby and Kelly for that. Patrick has also gotten Kevin used to being handled by people, and has clipped his nails, given him a light bath, put coconut oil on his dry beak, cere and feet, and filed down his beak just a tiny bit. The good news is that Kevin is easy about being manhandled, he rarely bites and usually only struggles for a moment before letting you maintain him. He is also a good flyer, his clip was done very well at Benson’s before he came home and he can fly well enough, but not expertly. He is even able to make it three feet off the floor. My “training” focus with Kevin has been more about getting him used to being with people. I have him sit on me and feed him millet, talk softly to him and close my eyes around him. I also try to go into his room and move around and do people stuff so he knows that “people” doesn’t always equal people making you do things you don’t want. Happily, after a week or so, Kevin recognized the cage as his home and his safe spot, which is awesome. It also means that every time we take him out he is fairly desperate to get back to his cage! So, that’s a bummer. But, I’m glad that he has someplace he wants to be at least. The sad parts are that Kevin hasn’t started making much noise yet and he doesn’t play. He flock calls with Toby and Kelly for about 5 minutes every day but that’s about it. He doesn’t engage with any toys and typically just hangs out in one spot every day, only moving around to eat a few times and when we move him. I feel very confident that he’s healthy and will be joining Toby and Kelly soon. His poop is perfection, his eyes are clear and bright, his nares are clear as well. His cere, beak and feet look awesome with no sign of mites. He is not fluffy or truly lethargic, he’s just scared to move! If I had any hint of sickness I would extend quarantine, but he looks to be a very well boy. If Kevin really is about two years old, then it’s no wonder he’s finding this so difficult. He has always lived in an aviary with I would bet no less than 20 other parakeets at a time. It must be absolutely terrifying to be alone. We’ve tried playing budgie noises and videos for him, but he didn’t enjoy it. Patrick is off from work for Kevin’s last week of quarantine, so we’ll do a final push on human acceptance and then get down to the business of assimilating him into the flock. I’m not anticipating a ton of issues, we’re going to do the introductions in a neutral room that no one feels ownership over. Kelly and Toby are at least mildly aware that there’s another bird in the house, and they seem very interested in meeting him. In the end, we got Kevin to enhance the flock life, and not with the goal of his being our best friend in the whole wide world. So, if he does well with the girls and starts feeling more safe to be himself we will consider it a rousing success!